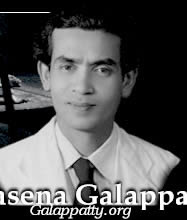 Gunasena Galappatty, was one of the greatest dramatists of Sri Lanka and his name is a legend among generations of Sinhala theatre goers. The work of a great life time has placed him among the immortals and has created for him a shrine in the world of Sri Lankan theatre. Galappatty was the pioneer of suspense drama in Sri Lanka. After an academic and dramatic stint at University of Yale and Broadway in New York, Galappatty emerged in to the forefront, creating a tremendous impact by his dramatic technique of the harmonization of stylization with naturalism. His legendary production "Muduputtu" was a land mark of Sri Lankan drama and was created such a sensation that it became a controversial issue in the Sri Lankan theatre. Galappatty proved that traditional theatre style could be blended very effectively with western technique. "When he directed a play, he was almost in a trance. The atmosphere was like that within a temple. No one would dare to disturb, while a rehearsal was in progress", one ardent follower of Galappatty stated. We invite you to browse this web site dedicated to his work and Sri Lankan Theatre.